The untimely death of Paul Walker - one of the lead actors in Fast & Furious series - has made the creators rewrite the script of the upcoming instalment and delay its release date. 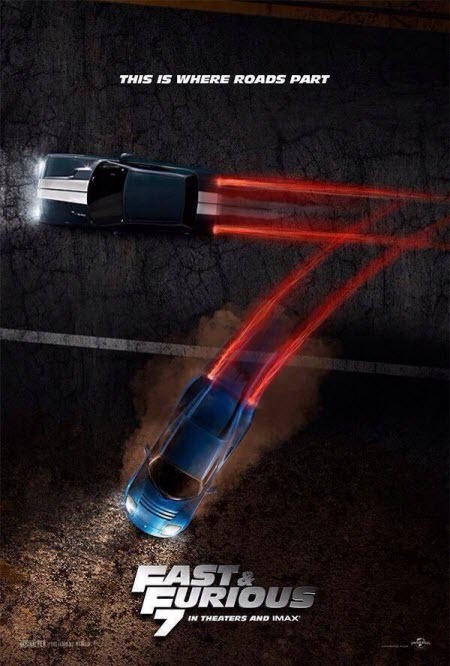 The first changes have been reflected in the new Fast & Furious 7 poster that has appeared in the network recently. Vin Diesel - another star of the project - has published the updated Fast & Furious 7 poster in his Twitter account, which is blocked for some unknown reasons now. The movie's picture shows us two cars that drive in different directions. The beams of light, which they leave on the road, form the number of the upcoming instalment - 7. And the headline tells us that this is where the roads part, obviously hinting at the character of Paul Walker. Together with the Fast & Furious 7 poster Vin Diesel has left a message: "The Fast and Furious 7 teaser poster makes me want to cry…". And what do you feel about the new picture? Are you waiting for the upcoming movie or do you think that it can't be full-fledged without Paul's character? Your answers are always welcomed at the bottom of the page.